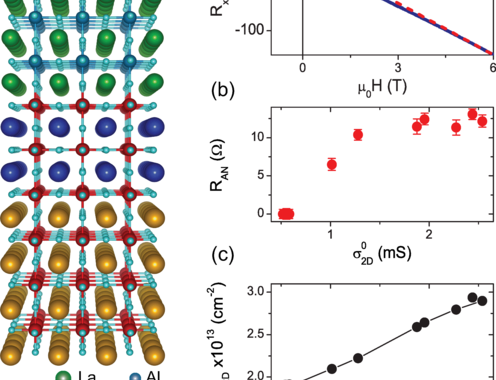 We report on the magnetotransport properties of a spin-polarized two-dimensional electron system (2DES) formed in LaAlO3 (LAO)/EuTiO3/SrTiO3 (STO) heterostructures. We show that, at low temperature, the 2DES magnetoconductance exhibits weak antilocalization corrections related to Rashba spin-orbit scattering, in analogy with the LAO/STO 2DES. However, the characteristic spin-orbit scattering field decreases substantially for carrier density higher than 1.9×1013 cm−2. We attribute this behavior to the masking effect of ferromagnetism, which sets in at the same carrier density and at a temperature below 10 K. Our work shows that, while weak antilocalization corrections to the magnetoconductance are strongly reduced by the emergence of ferromagnetism, they persist in a large part of the phase diagram of a spin-polarized oxide 2DES.